When it comes down to it, eating and sleeping are two things that people like to focus on when they have the time, so exercise is not a word that is often used in the vocabulary of the busy. However, an online personal trainer gives these people the option to stay healthy without neglecting their love for food and rest. There are fewer things people like to do more than eating and sleeping, so when an unknown word enters a sentence that involves neither eating nor sleeping, it has to be one that brings discomfort, denial and even shock. “Exercise?” they might ask. “No, there’s no time.” They have to drive to the grocery store, pick out semi-expensive frozen food boxes that come with calorie counts and who-knows what-kind-of chemicals and drive back home to unload said potentially chemical-filled boxes. They have to walk to the back of their vehicle to unload the contents of their car, walk to their house to unpack them into the freezer and walk to the kitchen to pop a frozen food package into the oven for themselves – not to mention walk back and forth to the freezer and the oven to cook a pizza for Junior. Exercise? It’s not like they have an online personal trainer. Besides – they have to walk to the couch to watch re-runs of The Voice while guiltily eating no-name potato chips and no-name dip after sending Junior to bed and spending the last free hours of their night tossing and turning through work-induced nightmares or visions of them singing out-of-tune karaoke songs in their underwear. That should be all the exercise they need! However, it’s clear from their collected frozen food containers in the recycling, no-name potato chip debris on the couch and unfortunate under-eye circles beneath tired eyes that exercise possibly, maybe, probably should be a word that does not involve discomfort, denial and even shock but literally a sigh of relief. Think of Yoga, Pilates or any other Asian-turned-American fitness that requires a mat and an instructional disk; there’s no complaining about having to get up early and drive to class, stretching in awkward poses in front of strangers who look better in spandex than they ever will. The people who partake in said activities “work out” in the privacy of their own living room, wearing God-knows-what, at whatever time they happened to get out of their perfectly-made, who-knows-how-many-thread-counts kind of bed and make themselves coffee and poached eggs. Their recently-bathed feet smell like goat’s milk or citrus or some sort of divine scent as they place them on their lime green just-rolled-out Yoga/Pilates mat – not the stink of sweat that is often accompanied to and from the gym by locker-socks and old running shoes. Exercise? They take a sigh of relief. They are their own online personal trainer. People like the above don’t need to spend time traveling to an expensive, prestigious place to work out, paying an expensive, prestigious personal trainer to tell them how to work out. To them, working out is another term for relaxation, not stress on their body, mind and wallet; to them, a gym is not a place confined by walls of weights but rather a non-confining space that a person can freely exercise their mental muscles. 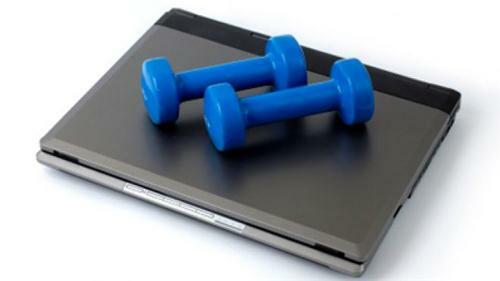 With only a brightly-coloured mat and all-the-time-they-need at their side they are their own online personal trainer. However, not everyone can arise whenever they feel like it to prepare freshly brewed coffee and perfect poached eggs for themselves, whilst smelling like they just came out of a spa, ready to face the day standing on some sort of mat for Asian-turned-American fitness; not everyone can lead such an ideal life. Often-times life gets in the way of the ideal and requires frozen food boxes and guilt-covered potato chips hidden in the creases of the living room couch – the same couch people with less-than-all-the-time-they-need use to fold their laundry on while watching re-runs of The Voice and falling asleep after putting Junior to bed. Exercise? Sigh. What if a person could fit a little bit of luxury into the hustle of your every-day adventure? What if the two types of lifestyles shown above could mix and create a hybrid of idealism and realism into the task of working out? Exercise would no longer be an unknown word that brings discomfort, denial and even shock – it would be as well-known as the joy that it brings the participant. However, “exercise” would become a new word – not “walking” or “shopping” or anything else that requires some sort of false effort that could be considered exercise; not “Yoga” or “Pilates” or anything else that false effort that that could be considered working out – but a mix of freedom and responsibility like cooking a proper, chemical-free meal and watching re-runs of their favourite television show. This new form of exercising mental and real muscles would involve two personal trainers: A real person and themselves. The person would be able to access this hybrid whenever they have the time, no matter how organized their life is and what they smell like. For the immense pleasure of the busy individual, this new word would become “online personal trainer.” GymRA has access to instruction on the internet used to give the best of both worlds when managing their health in the busy world they live in today. GymRA is your online personal trainer that keeps you moving, motivated, and headed towards your health and fitness goals.